Serato and Ableton set the date! | broken.me. Serato and Ableton set the date! 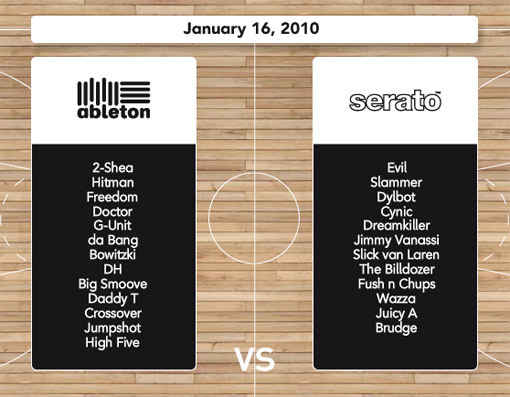 A while back, in October 2008, Serato and Ableton, two pioneering companies in the history of digital DJing, announced that they were forming a ‘creative partnership’. Serato and Ableton are happy to announce a partnership, which will pave the way for the future of Digital DJing. With shared artist rosters from hip-hop (DJ Jazzy Jeff, DJ Nu-Mark, A-Trak) to electronica (Paul Van Dyk, DJ Sasha), both Ableton Live and Serato Scratch Live are renowned as the premier performance platforms in clubs around the globe. While Serato’s Scratch Live excels in vinyl emulation, music library control and lightning quick hands-on scratching, Ableton Live provides the tools for production, on-the-fly remixing and beat creation. Just where this Serato and Ableton collaboration will take us has yet to be seen but one thing is clear: the worlds of DJing, remixing and production for artists worldwide have changes ahead. Pretty exciting news, especially for someone like myself who went for the tried and tested reliability of serato over traktor scratch, with it’s growing list of extras. Now, finally, after a pretty successful media blackout, it looks like the two companies are ready to announce what they have created since that announcement. The website is now active and the date is 14 January 2009, at the NAMM Show in California, with a live event to be held on 16 January in the same State. So all we can do is guess. The site provides some clues. It’s not very clear whether this is a lineup for NAMM or for the free ‘Getdown’ party in the evening, but the ‘Throwdown’ tab seems to suggest a ‘versus’ battle, with two teams representing the two companies. Despite numerous board room meetings and cross continental flights, the two music software titans are still in disagreement about some last minute product decisions… and so they have decided to settle it on the streets. On January 16, Ableton and Serato will lace up their favorite Air Jordans, toss on their Jordan jerseys and throwdown on the mean streets of Anaheim, CA. Check back for the final score! So, if we are looking at a battle between the two systems, then we have to assume, that at least it is going to be possible for the two systems to be running alongside each other. Which, you would imagine, would involve some sort of midi system to allow ableton to match the bpm of serato, with any slight drifts detectable to some degree. Other than that, it’s down to the imagination. Being able to run serato through ableton to utilise effects, record and rearrange ‘on the fly’ would be a well received addition. Serato’s latest addition of the SL3, with it’s ‘aux’ channel, plus 6 sample players in the software interface may also be involved in some way, allowing ableton output and prepared loops to play alongside the tracks being played in serato, opening up a multitude of ‘virtual decks’ for those for whom two decks isn’t enough. Hopefully, some efforts will have been made to facilitate the operation of both power-hungry programs on the same machine, with, perhaps, a ‘combination’ software interface that allows easy control of both programs without to much closing and opening of windows. Serato have a reputation for a ‘little and often’ approach, so I’d expect a system with more ‘potential’ than one burgeoning with loads of stuff, risking stability problems. One thing’s for sure, January 14 2010 is a date that is sure to start a race amongst the competition to develop things further in a struggle for survival. It’s going to be an interesting date for owners of all vinyl emulation systems. This entry was posted in Technology and tagged Ableton, Serato, Technology, The Bridge by shaman. Bookmark the permalink.